But beyond that – There are some notes that may be of value as you start to think about your filing situation. Standard deduction has gone up to $24K for married folks, $12K for the singles, $18K for head of household. In theory, this should make things less complicated. Most folks will go with a standard deduction and call it a day. This has gone from $1M to $750K. For those with home equity loans, the deduction for up to $100K is no longer available (unless grandfathered). This is not applicable to most folks, but some CEOs are going to feel it. The up to 2% miscellaneous deduction is now gone – this was used if you had business mileage not reimbursed by the company or you could include your tax preparation fees. No longer – my takeaway is that everyone is being pushed towards the streamlined deduction of $12K/$24K. Employers – be prepared. Employees may want to start expensing more of the miscellaneous stuff, the minute they do their taxes and figure this out. The biggest factor discussed was S Corp or C Corp, as this has huge ramifications. You want to run some scenarios to see if moving from one to the other is beneficial. But, don’t try this at home – talk to your CPA, make them run the analysis, and earn that fee! How much money is taken out by the owners? Are you cashing large checks? How many states are you operating out of,and therefore need to file state taxes for? Remember that ugly $10K cap listed above? Are you going to bring on additional shareholders? Distributions or dividends? What’s your strategy? Qualified Business Income (QBI) Deduction – soooo much here. Most of it seems to be in the “it depends” status (i.e. someone must be audited, sue, and then there is case law). This is the mysterious 20% deduction you might be able to deduct, but only if you have earnings within a certain range and aren’t categorized as a certain profession (those screwed: lawyers, athletics, financial services, investments, health and CPAs…. come on! Show these folks some love – they gotta figure all this crap out!). In short, it’s a hot mess and even though we know it has been coming, the cold hard reality of doing your taxes is about to sink in. BOOST does NOT provide tax advice but has a great network of CPAs that we can refer to you. Please reach out if you need a referral. If your CPA hasn’t already reached out or hasn’t talked to you about this…. FIND A NEW ONE. 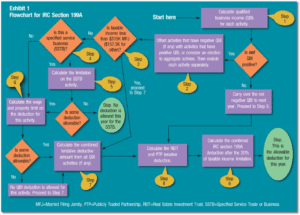 For those interested, here’s a flowchart from the CPA Journal on QBI that supposedly makes it easier to understand. We recommend drinking a lot of coffee before digesting this. https://boostllc.net/wp-content/uploads/2019/02/BOOST-Tax-blog.png 315 560 BOOST https://boostllc.net/wp-content/uploads/2019/04/boostlogo-new.png BOOST2019-02-05 20:48:312019-02-06 13:09:20Tax Reform – WTH?